Aston Martin is opening up a new world of exhilarating driving excitement with the announcement of the hotly anticipated V12 Vantage S Roadster. Equipped with the latest 565 bhp (573 PS) Aston Martin AM28 6.0-litre V12 engine, featuring state-of-the-art Bosch engine management, the car is capable of reaching 201 mph and sprinting from rest to 60 mph in only 3.9 seconds (0-100km/h 4.1 seconds). Peak and low rev torque is delivered in abundance. 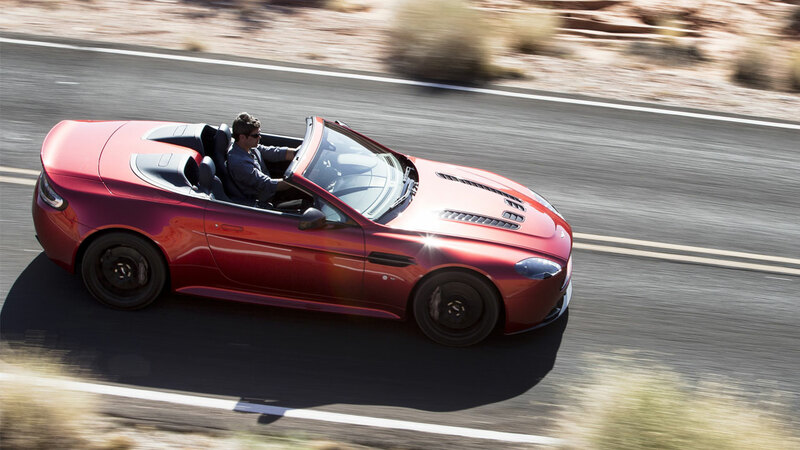 With 620 Nm available at 5,750 rpm the V12 Vantage S Roadster is not to be found wanting in this vital department. Crucially, too, low rev torque – measured from just 1,000 rpm – starts at a colossal 510 Nm. Together, these statistics demonstrate the Aston Martin engineers’ ability to create a ‘flatter’, yet ‘fatter’, torque curve which supports exceptional driveability and strong pick-up through the gears. Aston Martin Director of Design, Marek Reichman, said: “The V12 Vantage S Roadster is the mechanical embodiment of our company’s exceptional spirit. “Beautiful, powerful and spirited it is as spectacular to listen to as it is to look at. The new roadster is truly a treat for the senses with, underlying all this, the capacity to deliver one of the most dynamic, exciting and stirring driving experiences in our current range. As with its coupe sibling, race car technology runs right through the DNA of the V12 Vantage S Roadster with, for instance, CNC machined combustion chambers and hollow camshafts just two examples of track technology feeding through to the road. Another clear example is the new car’s Sportshift™III 7-speed transmission. Engineered to exploit the full sporting potential of the V12 engine, the latest generation Sportshift™III hydraulically actuated automated manual transmission provides motorsport-style paddle shift changes for optimum performance delivery. 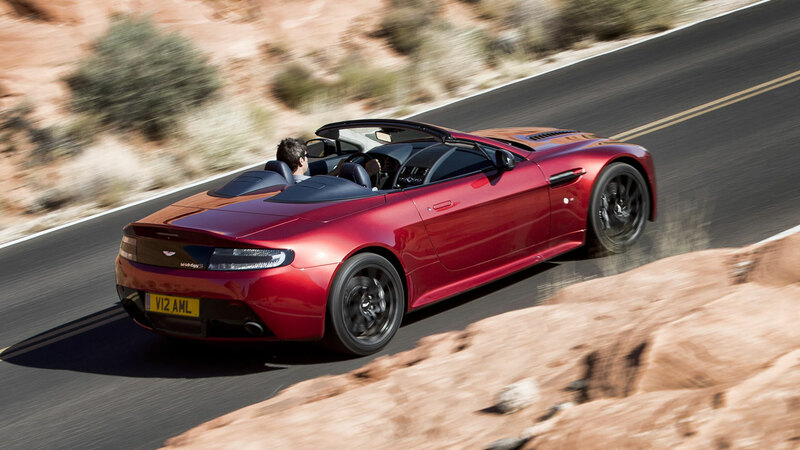 The unit, which replaces the six-speed manual gearbox found in the previous V12 Vantage Roadster, is also appreciably lighter – saving 20 kg versus its forebear. This race-derived and motorsport-proven technology – used routinely in Aston Martin Racing’s race-winning Vantage GT4, GT3 and GTE competition cars – provides for great driver control with only milliseconds of torque interruption and delivers precise and swift gear changes. The Sportshift™III transaxle, developed in conjunction with transmission experts Oerlikon Graziano, joins an extensive array of new sport and track-focused developments that ensure the V12 Vantage S Roadster is fully equipped to exploit the huge performance potential of its 6.0-litre naturally aspirated engine. The use of three-stage adaptive damping, allied to three-stage DSC and two-stage ABS, allows the driver to more precisely tailor the car’s dynamic character. ‘Normal’, ‘Sport’ and ‘Track’ modes provide a broad swathe of dynamic performance that can be tuned to better suit the driver’s requirements. The system also governs the level of power steering assistance offered. Working alongside the extended chassis capabilities is a ‘Sport’ mode, controlled via a button on the centre console, that alters throttle response, gearshift speed and timing, and exhaust note to, once again, tune the character of the car to the driver’s requirements. Optimum braking performance is delivered via the specially-created carbon ceramic discs all round, with near-identical brakes appearing on the brand’s ultimate GT, the Vanquish. Meanwhile a whole new lightweight exhaust system – derived from that of Aston Martin’s most expensive and exclusive production model, the One-77 hypercar – is wonderfully sonorous. The ZF Servotronic power assisted steering offers a quick, slick, 15:1 ratio and, linked to the adaptive damping button, provides two-mode steering assistance designed to best match the ‘Sport’ or ‘Normal’ settings generated by the Adaptive Damping System. 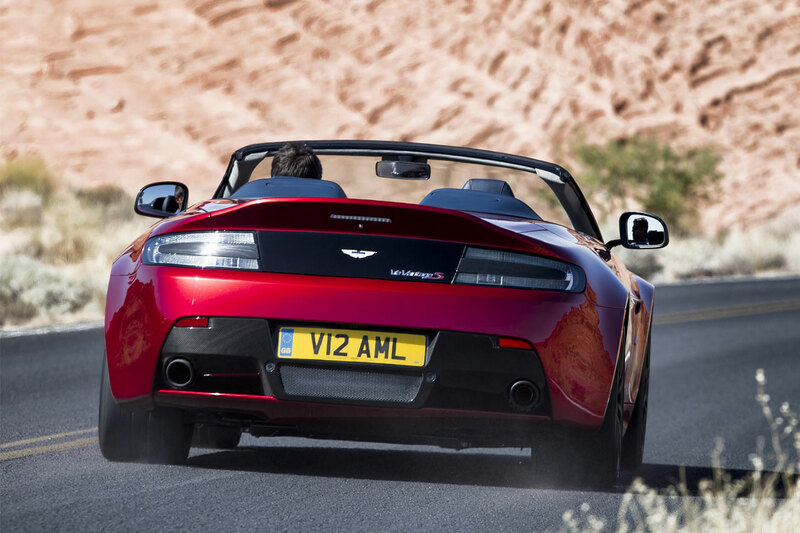 As Aston Martin’s most overtly sporting convertible, with an even more dynamic character than the luxurious Vanquish Volante ultimate GT or refined DB9 Volante, the V12 Vantage S Roadster has been styled to reflect is position as the flagship convertible in the Vantage family. In keeping with the V12 Vantage S Coupe, the Roadster replaces the famous aluminium vanes in the Aston Martin grille – with a carbon fibre arrangement that also includes sporty black or titanium silver mesh. Created to maximise airflow to the V12 engine, the new grille is inspired by both the remarkable CC100 Speedster Concept and the Vantage race cars. Other distinguishing features of the V12 Vantage S Roadster include the option of lightweight forged alloy ten-spoke wheels. The new Roadster retains the same compact proportions of its predecessor while features such as the pronounced bonnet louvres, optional bold graphics (painted carbon front grille, front grille lipstick and tailgate panel) as well as the exterior carbon pack and flared wheel arches underscore its sporting abilities. Inside, as out, the new car has been styled to reflect its powerful nature. New-style seat trim and door trims, with Sport and carbon fibre lightweight seat options – present V12 Vantage S Roadster buyers with an exciting array of choices. The optional Interior Carbon Pack, which adds carbon fibre to the car’s facia and door pulls, plus the availability for the first time in a V12 Vantage S Roadster of black pedals, further enhances personalisation options for those in search of a truly bespoke sports car. Meanwhile, For V12 Vantage S Roadster, the company is introducing a Q by Aston Martin Collection which comprises bespoke features that are entirely in keeping with the character of the car. For V12 Vantage S Roadster this includes a palette of bold exterior and interior colours; body coloured carbon bonnet louvres; a red tint or satin finish to the carbon fibre elements on the exterior and interior of the car; a full carbon fibre centre console, black anodised and machined rotary controls and a steering wheel with a leather on-centre stripe in the chosen interior accent colour. 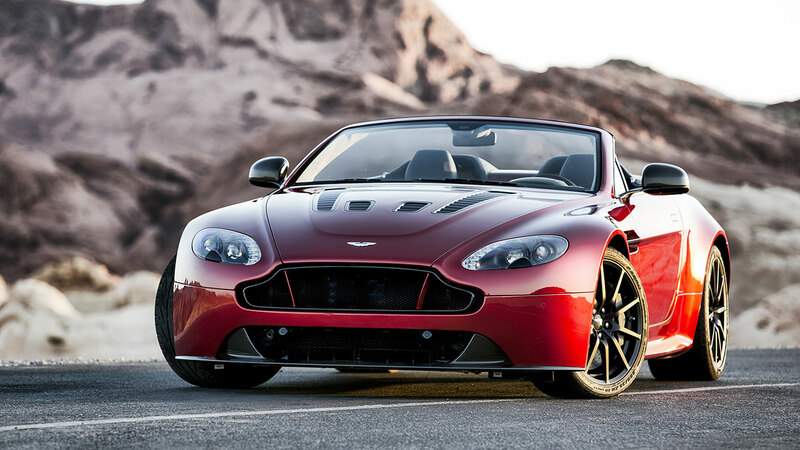 Marek Reichman added: “The new V12 Vantage S Roadster not only looks the part, but has been engineered and built to showcase the ethos of Aston Martin: power, beauty and soul.